While studying international law (graduated from Indonesian Islamic University) and painting (Indonesian Institute Of Art) in Jogjakarta (Indonesia), Wijono became active in the pro-democracy movement against the Suharto regime. The student movement which opposed inequality brought Wijono to look for a form which was efficient in delivering political messages. In the 1990’s he became known as a pro-democracy street performer with (or without) political demonstration. Besides a political awareness, Wijono gained an aesthetic understanding that performance art was a milieu that could be undertaken anywhere and was not restricted by exhibition space, public or even the time of the activity. 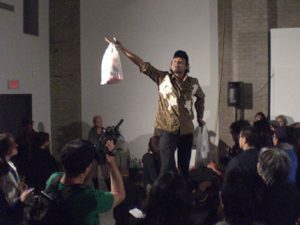 His early performance art interventions evolved to include arts events both locally and internationally throughout Asia, Europe and the Americas. Since the 2006 earthquake in Java, Iwan has been working with the people of Bantul (Jogjakarta) towards building a traditional healing facility and new cultural centre in the devastated zone. Wijono, director of the performance art organization in Jogjakarta, Performance Klub, member of TAV The Artists Village (S’pore), member international performance art movement New World Disorder International, member redaction board INTER arte actuel magazine, Quebec City (Canada), registered as spiritual healer in the World Pranic Healing Foundation.